From a selected location, a unit spawns and moves along the arrow. If you let the enemy reach the end of the arrow, your HP decreases. When your HP displayed on the upper side of the screen is reduced to 0, the game is over. The more waves there are, the stronger the units. There's another way to earn summoning power by destroying the rune stone. Rune Stones reward summoning power. Constructs like rune stones can cause various effects. You will receive additional summoning power each time your lich finishes a unit. 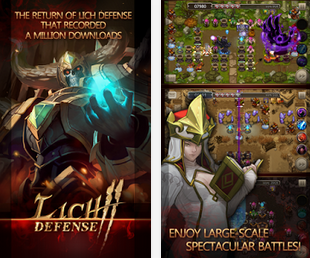 Every 3 waves, your lich receives the rank-up effect that increases it's basic attack power and skill damage. The Rank-up effect only applies to each stage and lets you use an additional stat. Buffs are displayed on the upper side of the screen. When you select the same buff, its effect stacks. Each time your lich reaches a new level, a skill point is rewarded so that you can learn and equip a new skill. Fortunately you can do it manually! To do it manually, just use search function in your hex editor app, enter your current Coins value in Lich Defense 2 and search for it (choose DWORD) . If you see a large list of results, you need to change the value of current Coins value in Lich Defense 2 by either consuming them or adding them. Go back to the list and find your new current Coins value in Lich Defense 2 to the large list and finally you can edit the value.